Learn how to sell a car the right way: how to state your car's condition, forms of payment accepted, protections to demand, and DMV issues to consider. Learning how to sell a car in the United States involves some simple, but necessary research. There are individual state laws that apply. Some of these rules are the same in all the states, but others will need to be corroborated by the DMV accountable for that state. All registration paperwork must be filed correctly and according to the laws of each state. At a minimum, you'll need a title certificate and a lien release letter (if such a lien exists). This is by no means an easy subject to cover. Each state has its own legislation which is not governed by the federal government, but by the state itself. Car purchase in each state will vary according to their laws. An example of differences between the laws of each state is that in Montana, a car title must be solemnized by a notary, but in Oregon this process is not necessary. Verify with the state DMV and follow the correct law. If you fail to take every step, you could remain liable for the vehicle. Some states now have protective Lemon Laws that protect buyers from purchasing a car which is not suitable for driving. Be aware of those laws. If someone has placed a lien on the vehicle title you will be expected to obtain an official release. This will take the form of a letter, signed by the lien holder, and must be filed concurrently with title and transfer forms. When you are selling a vehicle to someone from out of state, you are expected to have a title certificate before you sell the vehicle. If one is not available you must apply for a duplicate. The laws of both the states must be observed by the seller as well as the buyer. Both the seller and the buyer are accountable for suitably completing the instructions to transfer the car. Some states, like Massachusetts, necessitate that the cost of the car and the reading from the odometer be included, whereas others may not. It is legal to sell a vehicle without a title certificate in some states, so long as you have valid proof that the vehicle was sold to you. Proof such as a previous bill of sale or a sales receipt will be expected. The main issue to remember is to be sure that you are adhering to the guidelines in the state that you sell the car in. If you are indeed unsure about rights, verify with the Department of Motor Vehicles. Writing a contract for the sale of a car is not actually that complicated. There are some risks involved if you don't cover your bases. Make sure you transfer the car title correctly, indemnifying yourself against future use or misuse of the car, and protecting yourself from a buyer potentially misconstruing the state of the car at the time of sale. In addition to the paperwork to sell a car required by law, a contract is a great idea to provide an umbrella document to the entire process. The first thing to write in your contract is that you, the seller, agree to sell the buyer the car. Include your full legal name, the buyer's full legal name and the pertinent details of the car. Make sure you include the make, model, year and VIN of the vehicle being sold. This section establishes that the sale is occurring. State the conditions of the sale. Be sure to include the date and price agreed upon. For example, use language like "The date of sale is January 1, 2012, and the mutually agreed price is $6,500." State which forms of payment you will accept. You should never accept a check as payment for your car. If you sign over the title and only take the buyer's word their check is valid, you set yourself up to be left without any payment. Be sure to only accept money order, cashier's check or cash. The next section should describe your responsibilities as a seller. For example, you may agree to provide written documentation of the odometer reading, a valid copy of the vehicle title, and registration at time of sale. Depending on the laws in your state, you may also state the vehicle has passed all smog or pollution inspections. You can include anything you deem pertinent in this section, and is very much specific to the details of your sale. Last, protect yourself from any responsibility for the vehicle after the time of sale. Specify that the vehicle is sold in "as is" condition, and that you make no guarantees about the condition of the vehicle. The onus is on the buyer to make sure they are buying a quality vehicle. This section might look something like "The vehicle is sold in 'as is' condition and the seller takes no responsibility for the state of the car after the time of sale." Once the contract has been signed, you can proceed with your sale. After receiving acceptable payment as stipulated in the contract, you may proceed with transferring the car title and resolving any other paperwork. Consulting your state's DMV is the best way to make sure you are obeying all laws and filing all paperwork for selling a car as required by law. DMV requirements for sales of used vehicles vary state to state, but there are a few things you'll need to keep in mind to properly and legally sell your vehicle to another individual. If you fail to meet these requirements, you may be faced with legal consequences and fines down the line. Therefore, it pays to take the extra time to make sure you go about all of the DMV paperwork and other procedural steps to properly transfer ownership of your car. Car paperwork involves transferring the title, re-registering the vehicle if necessary, changing insurance policies and more. When you're planning to sell a car and have found a suitable potential buyer, contact the DMV in your area for a checklist of things you'll need to take care of. Generally, the most important issue in terms of paperwork is the title transfer. Sell a car without the title properly transferred and you run the risk of maintaining ownership of a vehicle that is out of your control. In order to properly transfer the title, you have to have the car inspected by a certified mechanic who can issue a vehicle inspection report. You also need to obtain a title transfer application from your local DMV. 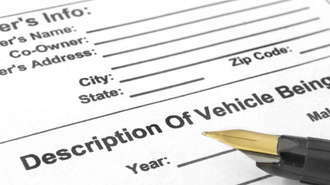 You and the new owner of the vehicle must fill out the application together and sign the title. You also need to have the odometer checked so you can get an accurate reading for the mileage on the car. If the ownership of the car is transferred to a new person, the vehicle will have to be re-registered. This is the case even if the car doesn't move from one state to another, or if the previous registration is still valid. The new owner can simply fill out registration application materials at the DMV. The DMV will require that you have valid insurance on the vehicle before a new owner will be able to drive it. Before you sell the car, contact your insurance company to have them cancel any existing coverage for that particular vehicle. Be sure that the new owner of the car is aware it's illegal to operate any vehicle without insurance in the United States. Whenever you sell a car, a bill of sale is an important document to execute as part of the sale. In the event you are accepting payments, a bill of sale promissory note will suffice. This document will prove you are no longer the owner of the vehicle, and therefore are not liable for its use or misuse. It will also relieve you of all future responsibilities of registering the vehicle, renewing its registration and maintaining its smog adherence status. Whenever a vehicle is involved in a car accident, its registered owner is also liable for any and all damages and/or losses resulting from the car accident even if they are not driving the vehicle. Therefore severing any connections to any vehicle you currently do not own or possess is extremely important. Any lawsuits can be costly, even just to prove you are not liable because you did not own the vehicle at the time of the car accident. However, it is easier to not have that situation occur in the first place. In the event that the car is misused, (i.e. used as a getaway vehicle or for buying or selling drugs,) you can be included in any litigation resulting from such misuse. Once again, it is more time-consuming and costly (i.e. attorney's fees) to extricate yourself from any liability. Proving non-ownership at the time of the offense can also be difficult. In the event the new owner does not register the sale of the vehicle with the local Department of Motor Vehicle office, you will receive all registration notices for that particular vehicle, including producing smog compliance certificates. By possessing a bill of sale for the car, you will be able to prove the responsibility for maintaining the smog certification, renewing the registration and paying registration renewal fees is no longer yours. Failure to pay these fees can result in a lien being placed against you, resulting in a "ding" against your credit. Learning the law will help to protect you as a buyer or a seller. This is just a basic overview. Naturally, car laws vary by state and local ordinances. Lemon laws. These laws were enacted to protect people from car dealerships who may take advantage of them. They vary from state to state, so you should contact your local authorities to get more detailed information. Some of the variables in Lemon Laws consist of limitations in mileage, age and selling price. Some states offer protection from individual sellers, while others allow protection even when a car is sold "as is." All of this depends on your state. Warranty laws. Always keep a copy of your vehicle warranty. Common car sale law protects you from foul play when it comes to vehicle warranties. If any of the information contained in the warranty proves to be misleading or an outright lie, you can receive damages. The warranty also comes into play when Lemon Laws are used for protection. Most lemon laws only apply to vehicles that are under warranty or guaranteed. Cooling off period. Contrary to popular opinion, the 72 hour cooling off period does not apply to car purchases. In other cases, you have three days to change your mind about a major purchase, but auto sales have been excluded from these laws.